The occupants of one of Augsburg's newest construction projects have claimed their cubicles and moved files and personal effects. As of October 31, the Office of Admissions—home to the staff of undergraduate and graduate admissions—is open for business on the lower level of Christensen Center. Julie Edstrom, vice president of enrollment management, said the admissions staff has been talking for a few years about co-locating undergraduate and graduate operations. The first step in the process came when undergraduate transfer counselors began working together. Since many Weekend College students are technically transfer students, having completed an associate's degree or at least a handful of credits at one or more colleges, it made sense to combine the recruitment efforts of both Weekend and Day staff working with transfer students. "Now, when a student comes and says they aren't sure if the Weekend or Day program is best for them, the counselors can help them find the best option." Edstrom said. The second phase of co-location was moving the graduate program counselors from the house on 7th Street and 21st Avenue South into the upper level of Christensen, meaning all admissions staff was in the same building. Edstrom said the new space was better and allowed the staff to make use of efficiencies with paperwork and processing, but the staff still wanted more integration. And though the first floor admissions suite provided a fun atmosphere for welcoming potential Day students and their families, it was not adequate to fulfill all of the staff member's needs. "We wanted a more roomy area with comfortable spaces for meeting people and visual separation of the work area from the meeting area," Edstrom said. The new space, which was designed by BWBR Architects of St. Paul to coordinate visually with other campus offices, provides visit rooms that can be tailored to the needs of prospective students. The welcome area is large enough for admissions events and allows for presentations. 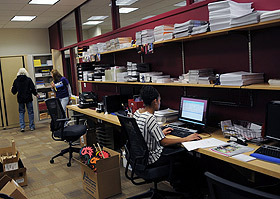 And the visit space is separate from the file processing area as well as individual counselor workspaces. Not only does the co-location allow for work efficiencies, Edstrom said it also gives parents of prospective Day program students a better understanding of the breadth of programs offered at Augsburg—specifically Weekend College and graduate programs. Edstrom said the new space will require an adjustment for the campus community, but she hopes that the 22nd Avenue building entrance, which provides access for people with limited mobility, and the visibility to the park will create a welcoming environment for potential students. "We think this space will have a positive impact on enrollment by creating a great first impression," Edstrom said. "It makes a statement of quality and shows our institutional pride." Watch the Daily A-mail for an announcement about an open house for the new admissions space. See Augsburg's photographer Stephen Geffre's photos of the admissions construction.